The mission established by Moses Merrill about three miles west of here was an early attempt to make Christianity a part of the daily lives of the Oto and Missouri Indians. Merrill reached Bellevue in 1833 and visited the Oto village in present Saunders County. In September, 1835 the Merrill family, in the service of the Baptist Missionary Union, were located in a log cabin and school house the government provided on the Platte. Led by Chief Itan, part of the Oto and Missouri built a village near the Mission. As the Mission developed, Merrill prepared a spelling book, a reader, and hymnals in Oto language. More buildings were erected and a blacksmith and farmer were added to the staff. The Oto were plagued by diminishing game supplies and demoralized by liquor. On April 28, 1837, Itan was killed in an Indian feud, and his successor was unable to maintain the village at the Mission. Merrill died on February 6, 1840, and was buried at St. Mary, on the east bank of the Missouri opposite Bellevue. Today a stone fireplace and chimney remain at the mission site. 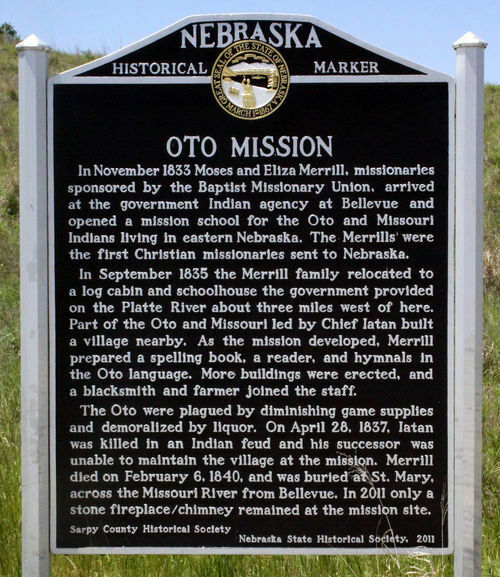 “Oto Mission,” Explore Nebraska History, accessed April 19, 2019, https://mynehistory.com/items/show/442.